Posttraumatic complex regional pain syndrome (CRPS) has a strongly negative impact on rehabilitation and activities of daily living. Treatment is most often unrewarding. To analyze the efficacy of endoscopic thoracic sympathectomy (ETS) in reducing pain and disability associated with CRPS prospectively. Over a 5-year period, 12 patients (7 females and 5 males; median age 46.5 [range 34–60 years]) with posttraumatic CRPS underwent unilateral ETS. The median duration of CRPS symptoms before ETS was 3.8 months (range 1.2–19.9). The sympathetic chain was resected from the 2nd to the 5th rib, and the nerve of Kuntz was severed. Median postoperative 16 months (range 12–40). Pain was assessed, at rest (passive) and during movement (active), using a visual analogue scale (VAS) from 0 to 10. One patient (8%) suffered a hydrothorax and 3 patients (25%) complained of contralateral compensatory hyperhydrosis. At 1 month (n = 12), 2 months (n = 7), 6 months (n = 12), and 1 year (n = 12) after ETS, there was a significant decrease in passive and active VAS (P < 0.05). Ten out of the 12 patients (83%) needed fewer analgesics after surgery, and eight (67%) did not need analgesics at all. The median sleep duration improved significantly from a preoperative value of 2 h (range 1–7) to a postoperative value of 6.25 h (range 3.5–8) (P < 0.001). Overall, patient satisfaction was 83%. ETS is effective at decreasing pain and improving quality of life, and should therefore be considered in the treatment of CRPS. 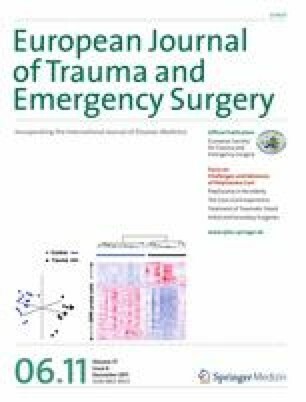 This paper was presented at the 10th Belgian Surgical Week, 29 April–2 May 2009, Ostend, Belgium, and at the 10th European Congress of Trauma and Emergency Surgery, 13–17 May 2009, Antalya, Turkey. The authors wish to thank Johnny Moons for the statistical analysis and technical support. The authors state that there is no ethical problem or conflict of interest. Rocco G. Endoscopic VATS sympathectomy: the uniportal technique. Multimedia Manual Cardiothorac Surg. 2004. doi: 10.1510/MMCTS.2004.000323.